Okay, the truth is, Man-Thing HIMSELF doesn't matter in the MCU. But Man-Thing as he has been USED on Agents of S.H.I.E.L.D.? That matters. Why? Well, through Agents of S.H.I.E.L.D. and the movies and the upcoming Netflix series (and hopefully through an Agent Carter series) there has been a lot of world building. And that has included hints. Subtle Easter eggs. But not as much as people were expecting. On Agents of S.H.I.E.L.D., up until now, we've gotten a lot of reminders that we are in a single universe. Stark gets a lot of mentions. Asgard comes up often. Romanov? She gets name dropped all the time, usually to be used as a comparison to others on the show. But while these mentions do serve as reminders that hey, this show is related to those big movies you like, the Man-Thing name drop is something a bit different. It doesn't just remind us of bigger stories that form a shared universe, it reminds that there are other stories happening out there. Around the corner. Around the world. Yes. As Daniel puts it, I'm the one. The one who actually got this cinder block of a book. About Man-Thing. I am a HUGE fan of Marvel's muck monster. For lots of reasons. * But I'll be honest, I don't ever need to see a Man-Thing movie** or a Man-Thing appearance on Agents of S.H.I.E.L.D. All I need to know is that somewhere out there, a swamp creature with an elephant nose, the result of a scientist trying to emulate the super soldier serum. Even more that Sitwell mentioning Stephen Strange, Maria Hill's mention of Man-Thing expands the universe. Mentioning Stephen Strange is still insular. It's to introduce a concept that will be on film again soon. 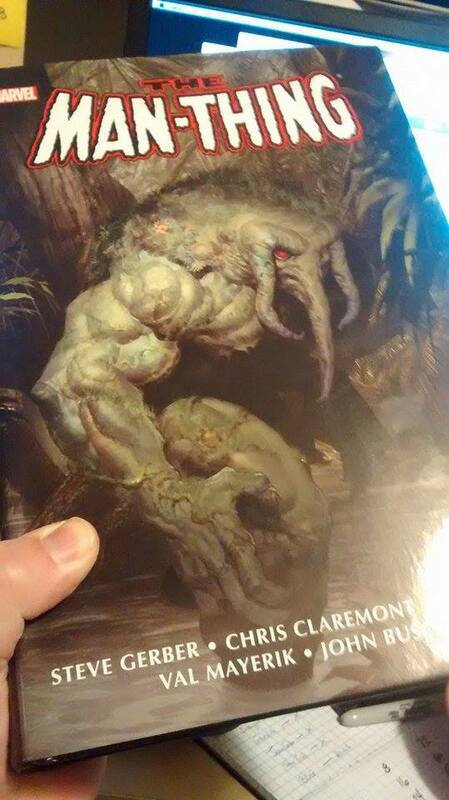 I seriously doubt Man-Thing will be returning to film. I don't want this kind of thing every episode, but it's nice every couple of episodes to get something like this to remind us that this universe is bigger than the movies. Bigger than the show. There are things going on, we don't need to know the specifics, just that there is more out there than all these connected movies and interwoven plot lines. 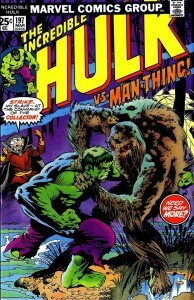 * The reasons I love Man-Thing stories — he's a muck encrusted and wordless Rod Serling. Man-Thing stories tend to be almost an anthology, with a few supporting regular cast members, but often revolving around original characters who are there just for that particular story. The best Man-Thing stories explore other people's stories, and then introduce a force of nature that observes, attracted to the emotions of the characters, and then as a monstrous observer he causes the emotions of the characters involved to explode, often through the literal burning of fear. “Whoever knows fear burns at the Man-Thing's touch!” These stories are human and emotional, and the fact that there is a swamp monster involved is incidental to the thematic resonance. Steve Gerber was especially masterful at creating these stories. ** Don't get me started on the existing Man-Thing movie. The actual movie itself is a scarier monster than the creature in the movie. In fact, if I were to write a horror movie, it would be the DVD of Man-Thing that stalks people and forces them to watch it to drain their life force. “And then, the movie drained ninety minutes of life from its victim, which could never be returned! And the movie became so powerful it spawned . . . a sequel!” Ugh. Shivers down my spine. The scariest things are those that mirror reality! If Man-Thing is featured in an future episode of MAOS, then I can see where an agent without fear can handle/detain Man-thing. Hence a spectacular fight scene between Agent May and Man-Thing. 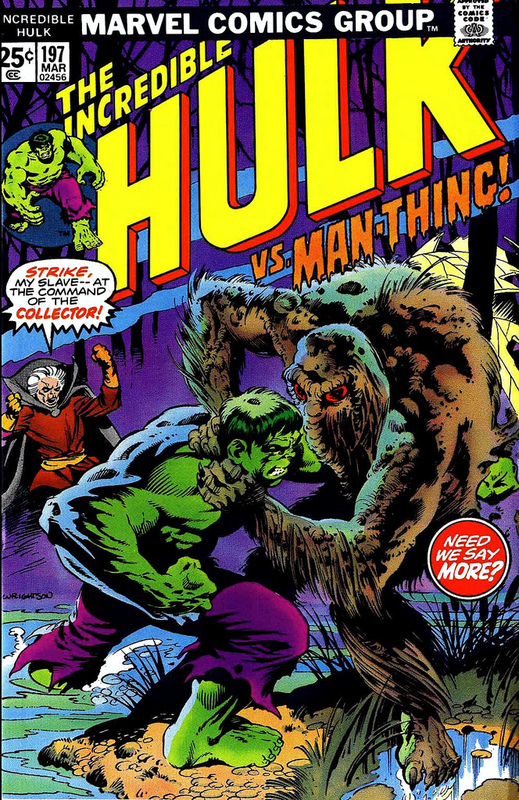 If Marvel wanted to switch things up for a movie, they could have a scary monster movie with Man-Thing being the antagonist. Mark’s idea is pretty awesome too, but even if it just stays at the mention (which I suspect it will) It’s cool to have that easter egg. I’d like to see him become a sort of mystery, with just an occasional easter-egg. He’s out there somewhere, but very little is known of him. Sort of like the MCU’s version of Bigfoot. HUGE Man-Thing fan myself, but I don’t think he can carry a whole film. I do, however, think they can introduce him in a Doctor Strange film via the Nexus of All Realities.